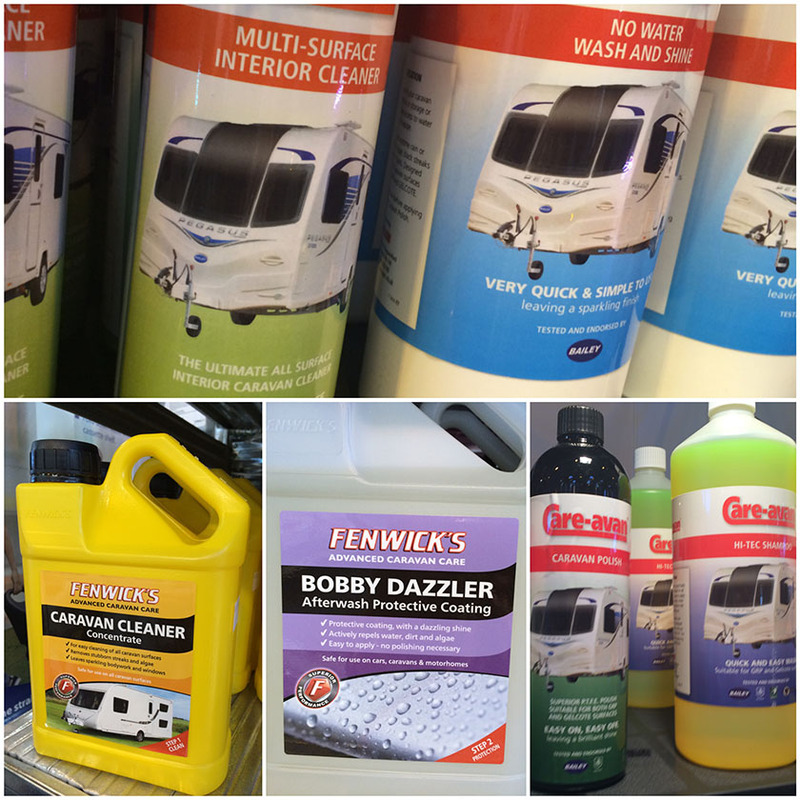 The new season is just around the corner and it’s time to start thinking about cleaning and polishing your caravan. So it’s time to get the hot water, shampoo, polish, brushes and dusters at the ready to give your tourer the once over. Many people might think caravans and cars are similar and could be tempted to dig out the car shampoo and jet wash when cleaning their ‘van. But, you need to remember that caravans have different paint and bodywork so need a less abrasive product so you don’t end up scratching the surface. Plus you need to take extra care with water, to prevent damage to the seals. Here’s our top tips for getting your tourer sparkling for the Spring. Also see our recent caravan cleaning video guide. First we’ll start with some DON’Ts! 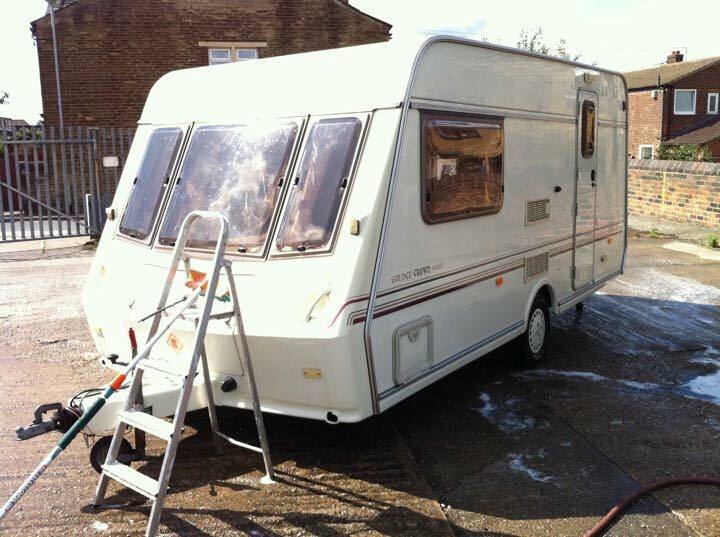 Don’t use a high pressure washers or steam cleaner to clean your caravan. This can damage the seals and longer term you could cause damage, and end up with a leaky caravan! Don’t use car or motorhome shampoo. These can be mildly abrasive and could scratch your caravan or could contain chemicals more suited to a car or motorhome paintwork. 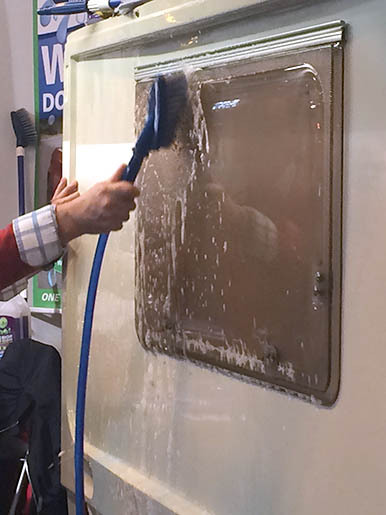 We took some expert advice from Stephen Page at caravan and motorhome valeting specialist Leisureshine, based in Bracknell, Berkshire. Clean your caravan from top to bottom, starting on the roof and working your way down. There are a number of leisure vehicle cleaning products on the market. Speak to your caravan dealership or manufacturer to see which products they recommend for use on your particular make of caravan. Care-avan polish also gets good reviews, as well as some of their other cleaning products and complete sets. 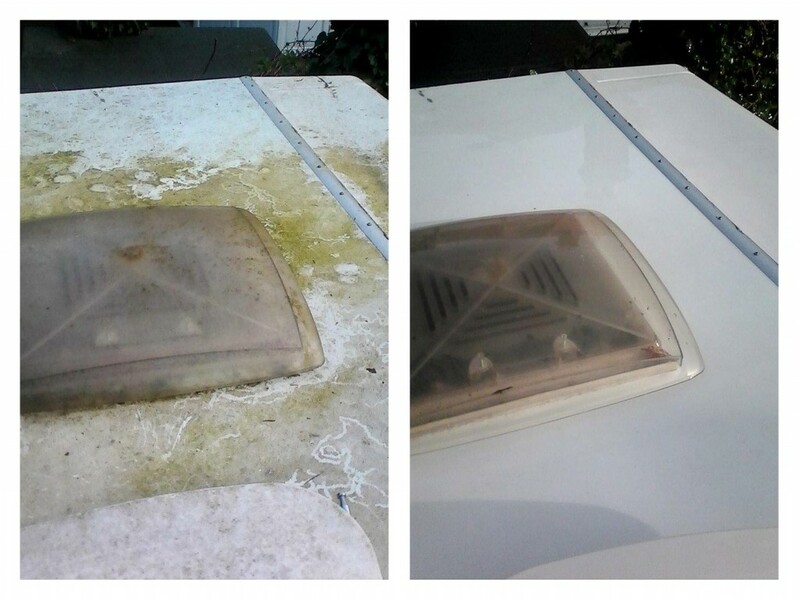 First rinse your caravan to soften any algae and loosen any dirt. Spraying with a hose pipe or throwing buckets of warm water over will do the trick. Tread carefully when cleaning the roof! You’re going to have to use a step ladder to wash and polish your caravan’s roof but do take extra care when there’s soapy water about. It’s probably best to have someone hold your step ladders or call the professionals in! Set the ladder’s platform or scaffold plate at the right height so you can reach across the roof. 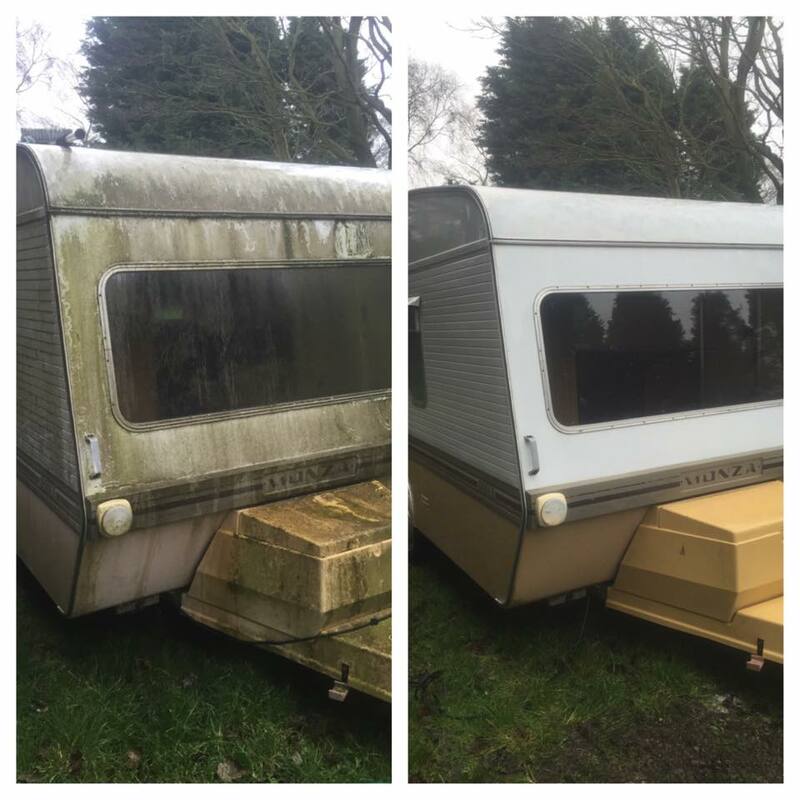 Using a shampoo and sponge or a long handled soft brush thoroughly clean the caravan using horizontal strokes across the roof and sides. Apply enough pressure to lift dirt, algae and stains and then rinse. Next clean the sides from the awning rails, cleaning these with a soft brush, as most of the black marks on your caravan come from muck in the rail. Work your way down with a soft brush, then shampoo and sponge each panel thoroughly, then rinse. “Stubborn black marks can be removed using polish which is a fine cutting compound. To remove black marks from the mastic around side lockers use white spirit on a soft cloth then wash off,” he added. 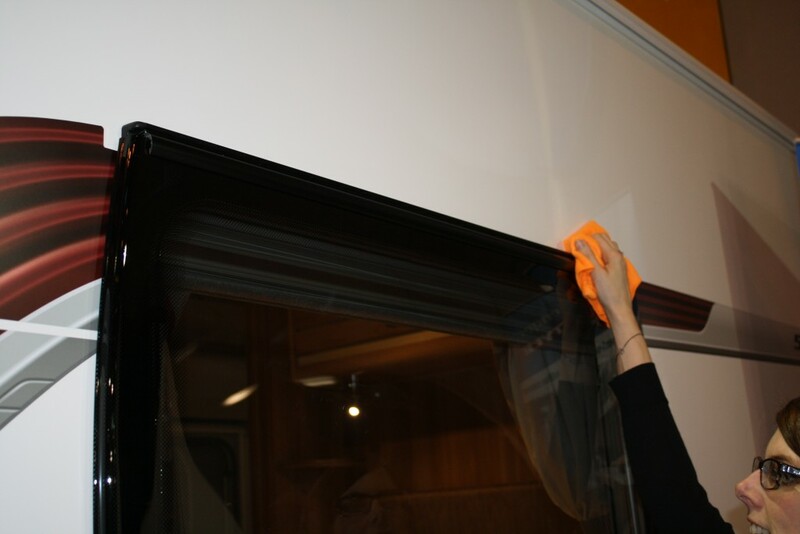 Extra care needs to be taken with caravan windows so think before wading in with the usual glass cleaning product. They can be easily scratched or damaged by chemicals so make sure you use a product specifically for acrylic windows and a microfibre cloth, to reduce the static. First softly hose or sponge your windows down to remove any grit using plenty of water. Use a special window cleaning set such as Dometic, Autoglym’s Fast Glass, Fenwicks Windowize, or Care-avan’s Window Cleaner. When you’re happy you’ve removed all trapped, stubborn dirt, wipe with a microfibre cloth. Once you’ve finished cleaning the exterior you can choose to let it dry naturally or use a drying cloth to speed things up. A large microfibre cloth works well and is cheaper and softer than a chamois leather. When your caravan is dry apply polish and plenty of elbow grease! Thoroughly vacuum the carpets and upholstery. Use anti-bacterial spray on the kitchen surfaces and give the windows a clean with the same specialist cleaner used for the outside. Use microfibre cloths and polish to dust down shelves and air fresheners and scented drawer liners will help neutralise any unpleasant smells whilst your unit has been in storage or layed up for winter. Make sure you keep a good air flow through you caravan to prevent condensation and damp, and always leave your fridge door open when it’s not in use. You can use the usual mild domestic cleaners for cleaning your fridge and bathroom area. The drains in the caravan sink can give off a some nasty smells, particularly after being left in storage or in between trips. Mix a tablespoon bicarbonate of soda with a litre of warm water, place a bung in the outlet and then fill the pipes. Leave for a few hours and then rinse away. Or you could try a flexible drain cleaning rod and rotate brush through the pipe before rinsing with the bi-carbonate of soda mixture. One of our readers also uses Puriclean to refresh the water tank, all internal pipework, and to clean the drains. My friend has a 30 foot Hobby Caravan that remains in the same place as his home (as opposed to touring). He insists on having heat from an electric type fire in the lounge as he feels the cold a lot. He is now insisting on putting a further heater in the bedroom section (located at the front of the caravan) due to damp and condensation. Reading another post above I have never found that damp and condensation are rectified in a small space by attempting to overheat. I think a very small dehumidifier would work but, due to his obsession with overheating, I suspect one’s eyes would dry out. Any suggestions at all would be gratefully received. I purchased a caravan cover and used it every year but this had two nasty consequences: Firstly the cover rubbed against the acrylic windows in strong winds and caused some fine scratching. The following year we wrapped the acrylic with cling film but this created a chemical reaction with the acrylic which caused some crazing. So the following year we covered the acrylic with old bed sheets cut to size and trapped this in the windows.That did the trick. Secondly, we had some serious damp causing the front shelf over the window to go soft and needed replacement. Since we are able to get a mains connection to our van we put a very small dehumidifier in the van on a timer.The van stays very dry and smells nice too. A neighbour put a heater in his caravan but this caused more condensation due to the temperature differential. This was a mistake. Leave a couple of sheets of newspaper inside the fridge when not in use. It absorbs moisture and prevents any mildew/mould. Thanks Andy – great tip! Good advice, but my problem is how to clean the caravan cover? The caravan is spotless beneath its green breathable fabric cover, but the cover is horrible. Covered in sticky tree sap and bird lime, plus all the dirt stuck to the tree sap. The cover is now in its 6th year and is very sound, but may have to throw away and buy new. Hi Richard, Protec recommend cleaning the cover using warm water with a soft brush, a hosepipe may be used but they don’t advise the use of power washers. Don’t use any detergents or chemicals as this will block the pores and affect the hydrophobic properties of the fabric. However, if you have any stubborn stains that will not be removed with just warm water, you can add soap flakes (the type you would use to wash clothing) to the warm water to aid the washing. Hope this helps? A few times a season I fill the water barrel with sterilising solution, which is then run through the system. If you leave the drain cover on this also fills the waste pipes. After leaving it for approx. 1/4 hour it can then be drained into the waste container, after which, rinse out the water barrel fill with fresh and repeat. This cleans and sterilises the whole system in one go. I have been doing this for over 25 years and it works a treat. Thanks John – great advice. 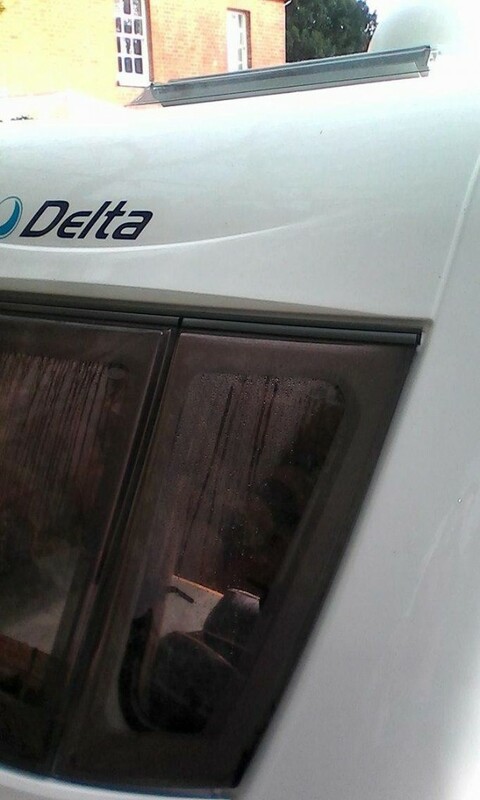 I always use furniture polish spray to clean my caravan Windows, it’s not abrasive and the rain just runs off a treat ! Be thorough it pays off in the end. Autoglym do a specific caravan and motorhome polish – http://www.autoglym.com/products/products/caravan-and-motorhome-cleaner – I’d advise checking with Autoglym before using their car polish on your caravan as it could be too harsh. 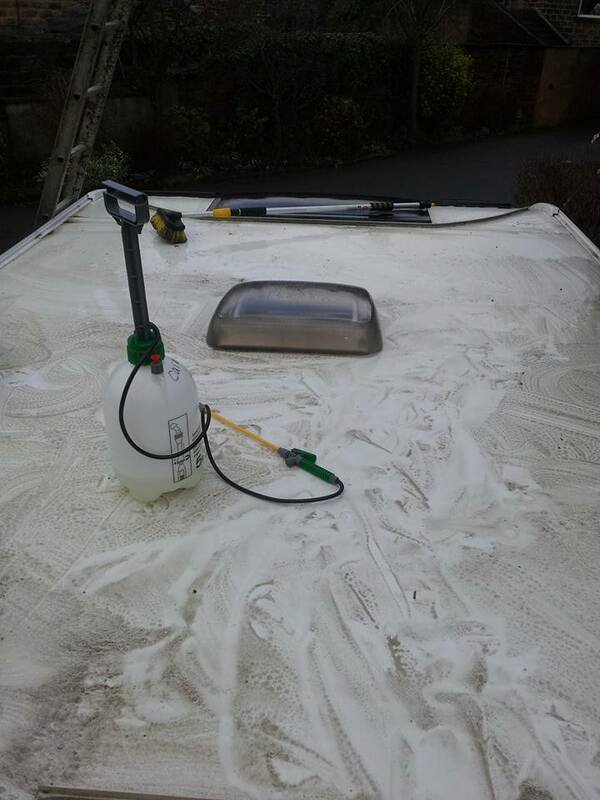 Your caravan surface and paintwork is is very different to your car. Can any body help? I have a little mold on my fly net, dose any one know how to solve this problem please. Hi Pauline, use a mould spray and place a plastic sheet behind the fly net when being sprayed to stop over spray. Hope this helps? 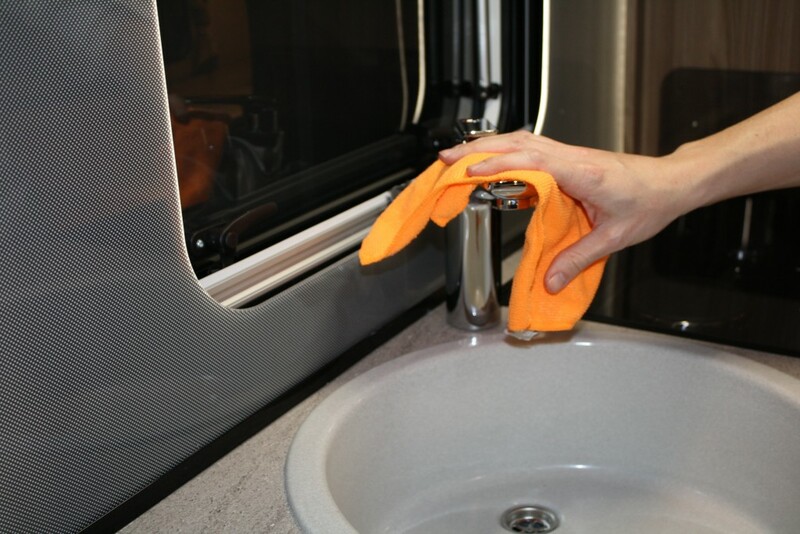 I always leave moisture absorbers in the caravan when it is not being used – one over the kitchen sink and one in the wash basin just in case of spills (plugs in both to prevent drafts and the dry air being replaced with moist air). They will need the dessicant replacing two or three times through the winter months. it is good to get into a van that is nice and dry and doesn’t smell musty. I also leave moth balls in the van to dissuade little beasties (not the grandchildren) from inhabiting it. I quite like the smell though my wife doesn’t – good job it dissipates with a brief airing. Thanks for the tips Ian. In reply to BJB’s feint marks on caravan, try a small dab of Silky (search Silky caravan cleaner). This is a mild paste supplied in a tub and is excellent for stubborn marks. A tub lasts years and you only need a small amount on a damp cloth to apply it. Great on black streaks too. Great advice about the bicarbonate for cleaning and refreshing the drains. Also the advice from one of the other comments re using Milton steriliser for onboard water tanks and water bowsers. Would like to know how to clean of faint mud/cow muck marks off the front of my caravan. Not coming off with caravan shampoo and elbow grease. I purchased a brand new caravan last Sept and had it treated with a special guard inside and out. What should I use on this to clean it but protect the guard? Hi Graham, we asked our cleaning expert and he said products like Autoglym Lifeshine, Diamondbrite, and Superguard are paint protection products. The manufacturer should advise with each product what you need to clean it with. If anything else is used this can take the guard off the caravan or motorhome. Hope this helps? Hi we have just got a caravan 1999 so this is all very new can someone tell me how you clean all the drains. Most drains are the flexible pipe type, our cleaning expert Stephen Page uses a flexible drain cleaning rod 2 metres in length, which is like a long spring that can be attached to a cordless drill. On the end is a brush, you can then rotate brush through the pipe. Rinse with bi-carbonate of soda. Hope this helps Cher? In reply to Malcolm’s query regarding the cleaning of dome skylights, there’s a pictorial specifically on these on my blog-site. We use Milton steriliser to refreash the water tank, all internal pipework, and to clean all the drains too. We also suggest a very good rinse out of the water tank to avoid taste contamination. Can anyone help Malcolm with his question…? Not too sure about the white spirit. I’ve found that this dabbed on my finger is ideal for smoothing out bath sealant so wonder what it does for seal sealant on the ‘van. Good tip about not using ordinary car wash, though. I carry a spray bottle filled with a product called Grease Lightning to clean off dust and black streaks during my outings. It also brings the shine back. It’s a bit expensive but well worth it! Really good advice as im new to the caravan world… handy tips like this goes along way I use car shampoo tho when reading this information I will get some caravan shampoo instead and yes goo tip about using white spirit and bicarb. .thank you. . Thanks for the information – particularly about the white spirit cleaning and also using bicarbonate on the drains. Excellent info – looking forward to the new season. Good tip about white spirit for the mastic. I always clean top downwards as for me it leaves the area that has been cleaned clean. Or you would be washing dirty water over a cleaned area.. I always do sections at a time with regards to the wash and then the same with the polish and Windows. Have a good year out their folks. I use renapur which is a leather care product on all my window and door seals. This greatly reduces the black streaks, keeps the seals flexible, avoids door seals sticking and possible damage in extreme cold weather on my motorhome. Ask permission from your wife first! Thanks for the tips – although your article emphasises cleaning from the top down whilst Fenwicks underline you should always go bottom up and explain it in their video. I’m not saying which is right – just thought I’d better point this out! This is just a guide. Different people will work in different ways so it’s whatever works best for you. Thanks for the names of products will give them a try out and thanks for the tips great help we are getting ready for our Easter break with the kids . Good information especially with Easter not far away now and we will all be getting ready to get those wheels rolling again.